I first saw Through a Glass Darkly in January of 2009. I was living in Boston at the time, and typical to that city in January, the temperature around 20 degrees in the afternoon. I had one of the worst colds of my life, and was running through Kleenex by the box. I don't know what compelled me on that day to watch this (much less make the extra trek home to go to the video store to acquire it), and while it did put me in the right psychological mindset to enter one of Ingmar Bergman's bleakest works, my familiarity with subtitled films made me forget the practical implications of having to read while my face was buried in tissues for half the running time. I thought it a solid addition to Bergman's filmography, the major works of which I was still working through at the time, but not as exceptional as Persona, Wild Strawberries, Fanny and Alexander, etc. But, hey, what better use for Criterion's Hulu channel than to dive deeper into a major work, and I believe Through a Glass Darkly is just that. The first thing I was taken by was just how watchable this is. Read enough about Bergman and you'll find that keeping the audience attuned and entertained was of foremost priority for him (even if his idea of "entertainment" was a little broader than most), and it really shows here. It's a short film - only 89 minutes - but a film about four people on an island could easily feel a lot longer in different hands. Taking place over the course of only 24 hours, the pacing is appropriate, giving us an insight into just how little time all four people have left together, and just how quickly that can come to an end. While Bergman could always be counted on for a certain dourness, his collaborations with cinematographer Sven Nykvist (starting with The Virgin Spring, in 1960) took on a different tone than those with his previous cameraman, Gunnar Fischer. Whereas Fischer's images were marked by strong contrasts between white and black, Nykvist's work during Bergman's final monochrome years infused his work with the color (or tone, if you will) gray. Bergman's films don't explore the battle between good and evil as individual forces, but his years with Fischer were strong in symbolism and a sense that there is a moral order to the universe, if only we could find it. His work with Nykvist, particularly in the 1960s, questioned even that, and the overwhelming grayness not only conveyed Sweden's endless winters particularly effectively, but also the notion that there aren't strong forces of good or evil, and that this is all some form of purgatory. 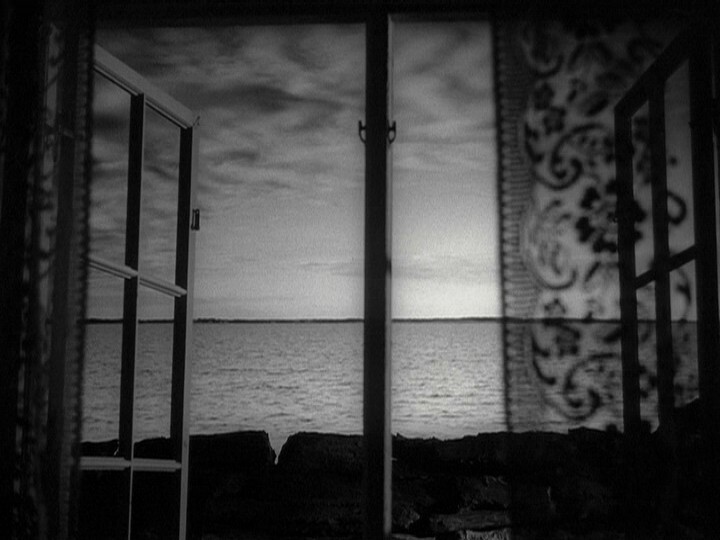 No unhappy accident, then, that Through a Glass Darkly marked Bergman's first venture to the island of Fårö, which he liked for its particular gloominess. And indeed, if ever cinema gave us a place that God rejected, Fårö would be it. Desolate, rocky, perpetually on the cusp of storm, and seemingly uninhabitable (the film is set in the modern day, but the company still heats well water for baths and explore the nighttime by candlelight), Fårö has become my mental image of purgatory, if not Hell itself. It is just off the shores of the island where we first meet Karin (Harriet Andersson), her brother Minus (Lars Passgård), their father David (Gunnar Björnstrand), and her husband Martin (Max von Sydow). Karin suffers, we soon learn, from schizophrenia, and has been going through one of her darker times as of late. Bergman's treatment of Karin and the her struggle with the disease is particularly noteworthy. First, he doesn't define it as such, though the symptoms are clear enough. By expressing the disease not as a medical concern (until the end, when unseen paramedics come to helicopter Karin to the hospital after a particularly nasty breakdown), but rather one of the mind and the soul, and not giving it a name, he allows for the possibility that Karin really has been given window into a deeper understanding of God and the nature of the universe. Or perhaps she has this ability, and her discovery is so overwhelming that it drives her insane. At any rate, Bergman approaches Karin compassionately, showing her breakdowns as an extension of herself, rather than a total transformation. He also allows her to know she's ill, making her a character we can at once connect to and feel pity for, while still remaining distant enough to be terrified the actions her madness drives her to commit. We come to understand that she can lose complete control of herself because she has such a clear understanding of what happened immediately afterward. If madness isn't committing surprising, unforgivable acts (and Bergman is extremely daring in exploring these depths for his time), but being unable to stop yourself, I don't know what is. And not nearly enough can be said for Andersson's performance, of which she said, "I was completely happy to play this sick person, to use my negative register and give it all in front of the camera to scream and race... At last I was out and up again! * Among people who embraced me - the more I yelled the more they embraced me... The cage was opened." She makes Karin endearing, terrifying, alluring, and tragic, quite often all at once. Bergman gets a bad rap for pushing his performers to histrionics, but those moments never feel unearned to me, and are part and parcel with his commitment to put all of his feeling onscreen. In performing scenes that could easily have seemed excessive with even a moment of hesitation, Andersson is unafraid to rip apart the seams of her character, just as Karin's mind is being eviscerated by the disease. *Despite being a regular fixture in his work in the early 1950s, Andersson hadn't been in a Bergman film since Smiles of a Summer Night in 1955 (the same year she and Bergman ended their three-year romance), and had given birth to her first and only daughter not long before filming commenced on Through a Glass Darkly. Through a Glass Darkly was a rare film that found almost immediate acclaim and has still withstood the test of time. It won the Academy Award for Best Foreign Film, and was even nominated for Best Original Screenplay. It has since lived on as part of a poorly-defined trilogy (Winter Light and The Silence followed), a designation to which Bergman regrets giving credence, writing, "the 'trilogy' has neither rhyme nor reason. It was a Schnaps-idee, as the Bavarians say, meaning that it's an idea found at the bottom of a glass of alcohol, not always holding up when examined in the sober light of day." The films could said to all be exploring aspects of faith, but that classification hardly distinguishes them from many of Bergman's other films. And though he once declared that The Silence would be his final film about the nature of God, it would forever be an inescapable part of his career, and was intrinsically tied to Fanny and Alexander, his final film. Nevertheless, Through a Glass Darkly can only be bought on DVD as part of a box set with the other two films in the loose trilogy. The HD transfer on Criterion's Hulu channel is marvelous, surpassing their DVD edition and practically a benchmark by which streaming video could be judged. The same day I watched this, I also caught Pale Flower on Hulu, and was disappointed by murky, blocky blacks and digital noise, none of which was the case here. It's a flawless representation of the film. I cannot recommend Through a Glass Darkly highly enough. Years after his death and decades after his heyday, no filmmaker has accomplished what Bergman did so regularly onscreen. He gave us new ways of examining the nature of faith, and through that the nature of humanity. He was the rare filmmaker to approach the nature of God with complete seriousness, but no reverence, and the result examines a world in which God is present, but can never be known. Those who glimpse Him go mad as a result. It's a terrifying perspective on the spiritual universe, but invigorating in its intellectual and emotional rigor. Absolutely essential cinema.